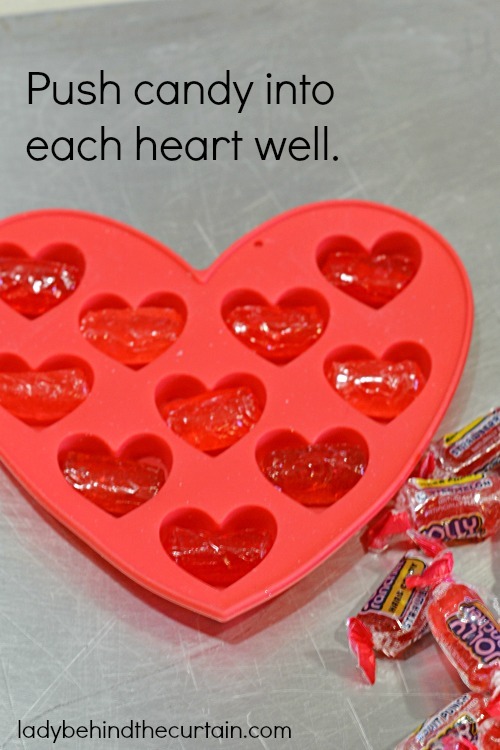 DIY Heart Shaped Candies | These Valentine’s Day treats are made with sweet and sour Jolly Rancher candies. It’s as easy as inserting a candy into a mold and melting it. Now you can create any shape candy you want as long as you have a silicone mold for it. These candies offer a BURST of flavor. Set them around the party room in candy dishes or bag them up in cellophane bags for your kids to hand out at school. 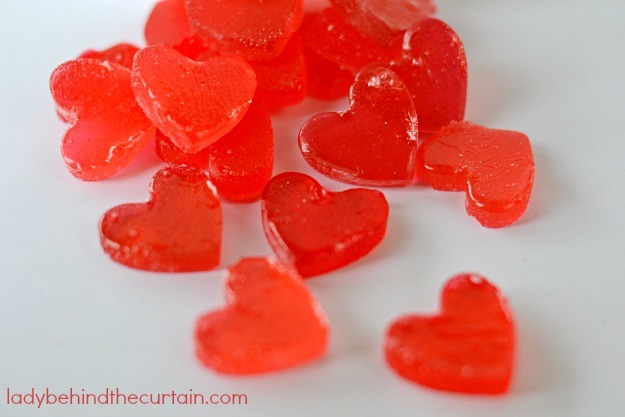 I found a bag of just red flavored candies but you can use your favorite flavors. 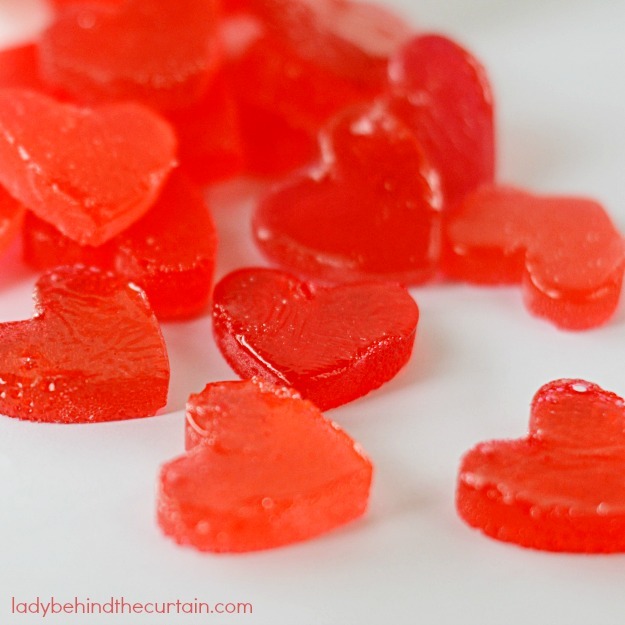 Make just cinnamon heart candies to that tea lover. 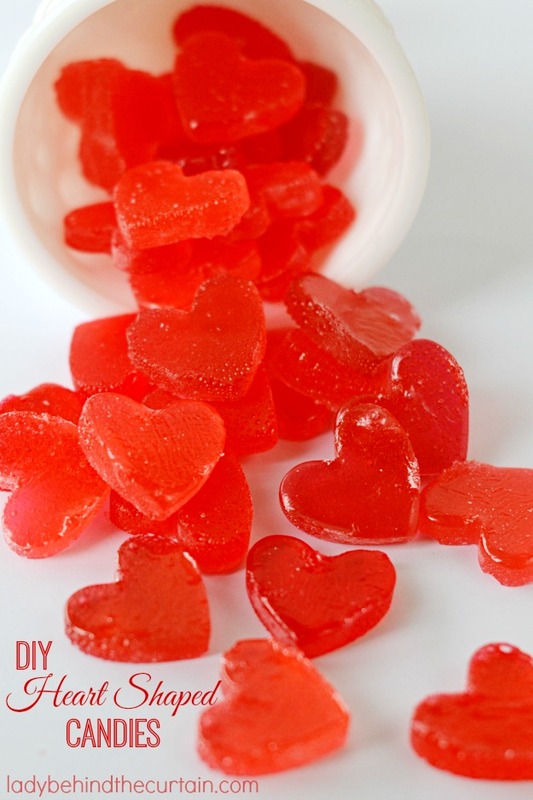 To add a little spice drop one heart shaped candy into a cup of hot tea. What a fun teachers gift that would make! I melted my candies in a 10 cavity heart shape silicone mold that measured 6-inches x 5.5-inches. One candy fit perfectly into each heart cavity. Place a candy in each heart cavity. Bake 13 to 15 minutes or until candy is melted. Place one hard candy in each cavity. Place silicone mold on a cookie sheet. Bake 13 to 15 minutes or until the candy is completely melted. Take cookie sheet out of the oven, leave silicone mold on cookie sheet 5 minutes. Transfer mold to a cooling rack. Cool completely; turn mold over and pop out candy. That is so clever! I invite you to share this yumminess at my Thursday Favorite Things blog hop ( you can link up until midnight tonight or join the fun next week) Hugs!